View Poll Results: Should we have a post of the day thread? Kyara, I have those images on a photo carpet dedicated to Milan (sub carpet-the fans-). oopsy, I just realized I wrote "carpet"---it was folder (carpet it would like in spanish, I'm really sucking at my english skills lately, but my espanglish is doing great apparently ), well, maybe on june I'll make a Milan carpet, I have a lot of newspapper pics saved. Kyara and Donie, thanks for quoting my post. Glad to know that my post could add some knowledge to fellow Milan fans or struck a chord in our collective minds. Weeks ago I was actually trying to locate the post quoted by Kyara, thanks for finding it for me. No worries. I just wish I could unearth more of your craftsmanship. Throwing modesty out of the forum for a second, I have a few posts I felt proud of after penning, but it seems to me they were many years ago....I would have to dig deep to find them. Okay, back to reality and I am selfless again! However....I think everyone will be able to find some humor in this thread. Mind you, this was years ago, and I was a bit more ruthless in my criticism in these days. I have almost grown up now though. Last edited by DonippoKakaShevdini; 05-05-2007 at 19:36. I don't recall that!!! Possible I was inebriated while positing. It happens from time to time. Didn't people say that Borriello was the next Van Basten?? Ah yes, I forgot that every midfielder has to attack(lie). Rino is so stupid(lie), only an idiot would think of actually playing defense(lie). You are absolutely right(lie)! We should sell Rino because he isn't good enough on ATTACKS (lie). The notion of a midfielder playing defense is absurd(lie)! I suspect the next person you want to get rid of is Dida, because he doesn't score goals like Palop? Last edited by Sasha; 22-08-2008 at 17:34.
the point of this thread is for others to nominate your posts!!! ^Yeah, don't put your own posts. It was a shite post that you didn't need to parade again, Rocky. I honestly like this. The kind of post that makes u think and challenge you to come up with something equally good. In the end, however, Mighty Milan will prevail + put a crappy season behind + those nouveaux riches + parvenus in their place. I got carried away a little. I think success comes in cycles + with all the money in the game right now + seemingly no end of the prospering in sight, the EPL might face a similar fate as Serie A... Some sort of implosion + self-cleansing.. once the dirt will come to the surface. The more is at stake, financially, the higher the likeliness of corruption. Has there ever been a more rigged game than Manure-Everton ? Generally, regarding truly keep-worthy posts, I'm not sure if I wrote more than 5 or 6, but they're lost in the forum vault anyway, like so many of the better contributions floating around here 2003-05 + that's a pity. Not for my modest input, but for the bigger + better ... rest. His post are although very long but always good to read. LOL, You should see the office emails I wrote for my team . I've always had this unconsummated desire to be a novel writer. I borrowed a lot from Tolstoy style : full of emotional description. is there a way not being emotional about milan? the quality of expressing one's emotions about milan is what makes a good post. I wrote this last nite with the match thread as the place to post but this thread would suffice. I finally have some time to collect my thoughts on the win. For me this CL 07 win was probably the most emotional CL and Champions Cup triumph that I’ve experienced. In 89 and 90 with the Dream Team (after winning the scudetto in 88) we proved that we were the best team in the whole world and the question was how many times we can do it. Although Olympique Marseille beat us next season (with the stadium floodlight scandal that brought the suspension from UEFA) but there was an atmosphere of full confidence that the team still had so much to offer since the core of the team was still intact. In 94 we displayed such menacing defense and the only temporary scare was when we had to face Barca in the final without Baresi and Costacurta. The football lesson we displayed overshadowed the fact that we also won the scudetto in the same year (albeit unconvincingly since we only scored 36 goals throughout the whole season). Before the game many of us felt “at least we still won the scudetto”. It was magic, we felt that we could still win the game but a 4-0 mauling was truly beyond our wildest dreams. In 03 we played beautifully throughout the whole group stage (even managed to gave away the last 2 games in each group stage since we qualified so early) and although we did just enough to beat Ajax and only qualified through the final by way of away goal vs Inter; we still oozed confidence and class. 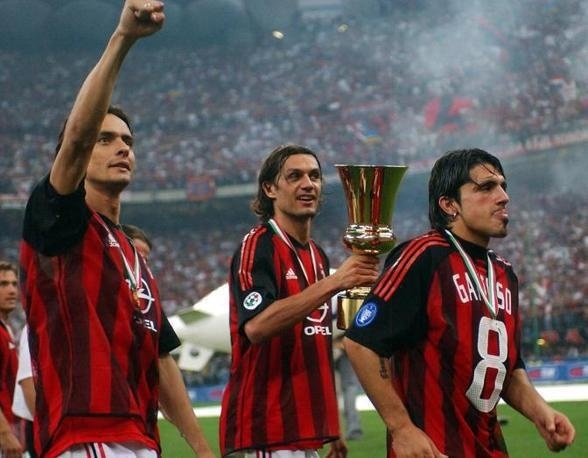 The arrival of Nesta finally ended Maldini’s search for the perfect partner that he’s been missing since Baresi, Rui Costa sprayed assists everywhere, Pippo scoring freely and Sheva recovered just in time. CL 03 trophy was a just and fair reward of the performance we showed. But this time, this 07 season, everything seemed went bad for us. The biggest blow came even before the new season starts when we lost Sheva and when you lost the 2nd all time scoring record for your 100+ years club, it will take some time to find a replacement. Then came the calciopoli scandal and the points deduction. Sheva’s departure along with the scandal simply signaled to one thing: the end of an era. We dreaded the thought of having the likes Maldini and Costacurta end their glorious career in a low note. Along with our domestic season, we failed to shine. True we topped the group but 1 draw and 2 losses from a group that consists of the likes of AEK Athens, Anderlect and Lille is far from convincing. An extra time goal from Kaka vs Celtics instilled the belief that a semifinal is the highest we can get. We only propelled ourselves starting with the away game vs Bayern and showed the world that we can still do it . Then there’s an emotional baggage of Istanbul in 05. When you live in an EPL saturated region like Asia, where ESPN Asia never failed to mention this every time the name of Lpool and AC Milan is mentioned and when there’s enough contingent of Lpool fans (glory hunter or true ones); you will be haunted. They say it’s either the biggest comeback or meltdown in the history of Champions Cup/League or some neutral fans will say it’s the greatest cup final they’ve watched. But it only points to one fact : we lost in such a hurtful way. The very mention of Turkey the country, or anything Turkish will bring back the memory of that crazy 6 minutes, that Dudek double save, that miss from Serginho, Pirlo and Sheva. Any Lpool game in any competition will be silently watched with disdain. Any mention of Benitez or Lpool players (active, already moved to other club, or even already retired and didn’t take any part in the Istanbul game) will boil my blood. Any penalty shoot out will sent a shiver. The sight of any Reebok products and Calrsbeerg ad will forced a dry smile from me. Any songs from the Beatles will sound like “You’ll Never Walk Alone”. Even if I watched Crespo plays with Inter or Sheva with Chelsea, it still hurts. All this will still make me take a deep breath and exhale it sadly. The only outlet of redemption is through PlayStation games and you just hope that we will be given one chance and one chance only (cue Mel Gibson speech in Braveheart) to prove that Milan still have the guts to do it. Just today a friend of mine (big Lpool fans) said he won’t be able to listen to any sport program or read any sport related news for at least 2 weeks because the loss will somehow got the mention. Deep down I asked him silently “It’s been only few days and no doubt that you’re still hurt. Now imagine the feelings we Milan fans had to endure for the last 2 years since it took us that long to get over it and exorcise the demons of Istanbul”. That’s what I felt, exorcise the demons of Istanbul! Milan players and staff said it’s not about revenge, it’s not about finally got something that we let slipped from our hands. They said it’s a different game and that they didn’t feel it. But they’re wrong. Deep down they know it’s all about revenge and we fans know it too. That was the text message I sent to other Lpool fans minutes after we beat ManU : revenge. In the news after the final the media will understandably mention Istanbul, some TV stations will even show clips of that game before showing parts of the Athens game. I still felt a pang of pain with that loss but somehow with this win, the pain is less, as if a Scarlett letter has been taken out of our jersey, as if the burden is finally gone. Somehow we can finally close down that bitter chapter in our collective memory and somehow we can say ‘we got our revenge and we won’. i would rather stick to seedorf than bring in ronaldinho..
All times are GMT +1. The time now is 04:41.